Noninvasive/Minimally Invasive Diagnostics | PSI - Physical Sciences Inc. Physical Sciences Inc. (PSI) introduces a powerful dual modality microscope for diagnosing skin lesions. 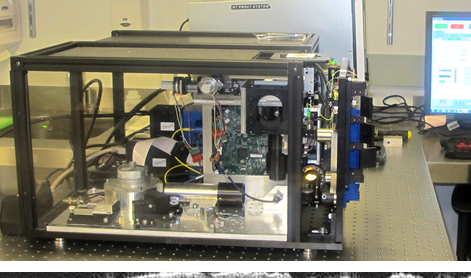 This microscope combines within the same optical layout two imaging modalities: Reflectance Confocal Microscopy and Optical Coherence Tomography. RCM provides en face images with nuclear-level resolution in superficial skin, to depths of about 200 m, while OCT provides cross-sectional images with structural-level resolution in the deeper skin layers, to depths of at least 1 mm. The complementary capabilities of these two optical technologies may be exploited to aid skin lesion diagnosis and therapy guidance. A highly portable, hand held version of the instrument is currently being developed at PSI to enable imaging of areas of the body that are not easily accessible with a benchtop instrument. PSI is pleased to offer an R&D grade OCT instrument for vocal fold imaging. The instrument is equipped with a custom probe that can be inserted in the oral cavity enabling dynamic imaging of the vocal folds. Currently, voice specialists make critical diagnostic, medical, therapeutic, and surgical decisions based on coupling visual observations of vocal fold tissue motion with auditory-perceptual judgments of voice quality. The PSI imager provides advanced 4D imaging technology (3D structural + dynamics) to gain a better understanding of the impact of vocal fold vibration on laryngeal sound production and provide otolaryngologists with a clinically viable tool to advance the diagnosis of early stage vocal disorders.